Both Brandt Broussard and Hal Hughes are the sons of baseball coaches. Broussard’s father Burke was the long-time head baseball coach at Baton Rouge University High School. Burke Broussard was the starting second baseman on LSU’s first College World Series team in 1986. Hughes’ father Pete is the new head baseball coach at Kansas State. He had been the head coach at Virginia Tech and Oklahoma. Last season, Pete Hughes was an assistant coach at Georgia. Having been around baseball their entire life, both Broussard and Hughes understand what it takes to be successful. Broussard, a junior college a season ago, and Hughes, a freshman last year, had their problems adjusting to big-time baseball. Broussard won the second base job and was enjoying a good season until he broke his left thumb in late March. Broussard, who was hitting .363 at the time of the injury, missed 13 games. He was not the same player when he returned to the lineup as his batting average fell to .260 by season’s end. Hughes was expected to serve as a utility infielder as a freshman. However, Josh Smith’s back injury forced Hughes into the starting lineup. He batted .221 and committed ten errors while starting every game at shortstop following the opening weekend. One season later, Broussard and Hughes will be back in the starting lineup when the Tigers open their season next week against Louisiana-Monroe. Broussard will be the second baseman, while Hughes is shifting to third base with Smith returning to shortstop. “Both Hughes and Broussard are more experienced this year,” LSU coach Paul Mainieri said. “Hughes was great last year when Smith was unavailable. He will be very good at third base. Broussard regained his confidence while playing last summer in the Northwoods League. He batted .317 with five doubles, two home runs and 13 runs batted in. 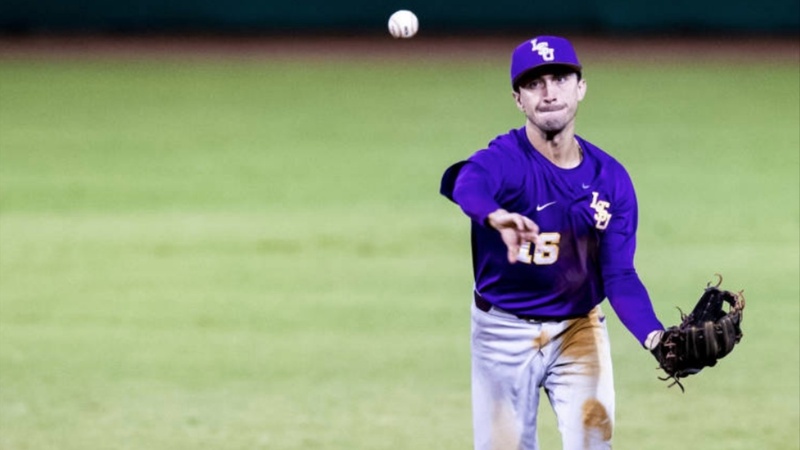 Broussard, who stole 14 bases for LSU last season, had 11 steals in the summer league. “I stayed home the first half of the summer and rehabbed three times a week,” Broussard said. “I felt that I could finally swing the bat the same way as I did before the injury. I had some success after struggling the last half of last season. Broussard understands his role on this very talented 2019 Tigers team, which is No. 1 or No. 2 in all of the preseason rankings. “I definitely feel more comfortable,” Broussard said. “I know what coach expects and I have been through the SEC. That helps my confidence. I just have another year to help the young guys. Hughes will have a similar role as Broussard – get on base at the plate and make the plays at third base. Hughes has not played third base since his freshman season in high school. “My older brother played shortstop, so I played third base my freshman year in high school,” Hughes said. “So, I have some experience there. Offensively, Hughes failed to put the ball in play enough times last season. He struck out 37 times. Hughes only had five more hits with 42. His on-base percentage was a poor .292.